I’m so excited to share the news that I have been asked to host the Manitoba section of the next Blogathon Canada. If you missed it last year Blogathon Canada is a week long celebration of Canadian Quilting Blogs and has been created by Sew Sisters Quilt Shop. How does Blogathon Canada work? Well starting November 18 and running to November 23 each day two host bloggers will introduce themselves and share their work on their blogs. They will also include a list of blogs from their province that you can visit as well. The host bloggers will also host a giveaway of some of their favourite goodies from Sew Sisters…I’m sure you can guess what I picked for a giveaway but I’m not telling yet! This time Sew Sisters has teamed up with Aurifil, Northcott and Robert Kaufman to bring us some great giveaway prizes! Check out Sew Sisters Quilt Shop blog for more info and see how you can join the party! If you live in Manitoba and have a quilting blog that you would like added to my days list please leave a comment with you blog address or send me an email and I’ll make sure your included in the party! I want to take a moment to thank you for your comments, emails and Facebook messages regarding my father-in-laws passing. They were all very comforting to read and to know others are thinking of you does help with the grieving process. I want to get back to my quilting soon as I find it very comforting to quilt, it can be very therapeutic. I will have a fun announcement to share on Friday and hope that will get me back into my blogging rhythm again. Our family lost a very special member on Friday, my father in law passed away after a two and half year battle with cancer. He loved to read my blog and see what has happening at the Tamarack Shack and would tell anyone that listened to go to my blog to see all the beautiful quilts. I know this as those people would email me to say Ed gave them my blog address and they enjoyed browsing my site. That always made me smile knowing how proud he was of what I had accomplished. You can see in the picture above he loved the Ragtime quilt I made him years ago, it was always on his lap or near his chair. It wouldn’t surprise me if he was reading one of my blog posts in this picture! I’m going to a take a week or two off quilting so if you’re waiting for a quilt to be finished by me I just wanted you to know why there will be a bit of a delay. Marlene also sent this pretty wool table runner called Coxcombs and Berries by Lisa Bongean of Primitive Gatherings. She asked that the outer border have beadboard quilting and SID around the appliqué, I could chose the background fill. I thought pebbling with a few feather motifs would be nice and would make the appliqué pieces stand out. Marlene said there are still red buttons to add on the branches for red berries. 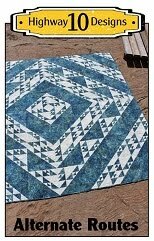 This is Marlene’s Wish quilt and the block patterns can be found free online at Red Brolly, just click here to see the pattern. When Marlene sent me her quilt top she said she she first saw this quilt on Kaaren’s blog, The Painted Quilt, and it inspired her to make her own. You can see Kaaren’s beautiful Wish quilt on her blog post here. Kaaren and Marlene both made changes to the original pattern. I used some of Kaaren’s ideas for Marlene’s quilt and then of coarse changed up a few things! I first decided to cross hatch the pieced outer border for a nice texture and then added loops to the inner black border. All the appliqué pieces and blocks are SID. The small squares are CC’d and the embroidered blocks are outline stitched and I added a few extra details to some block but I didn’t want to take away from Marlene’s beautiful stitches. I used a few different background fills like curls, swirls, meandering, wavy lines, diagonal lines, snowflakes, feathers, and wind. I used about 5 different So Fine thread colors and Dream Blend batting. This was a really fun quilt to work on! I also wanted to mention that an online blogger friend recently changed the name of her blog and lost all her followers!! I would cry if that happened to me! 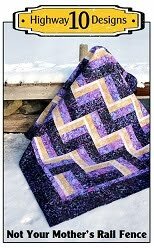 Laura’s blog was called Tanderwen Crafts and she changed it to Tanderwen Quilts. I had the wrong address in my sidebar for a few weeks but it’s now corrected and the link works again. If you have her blog in your sidebar or reader please check to make sure you have the right link. It is now www.tanderwenquilts.blogspot.com. Laura has a great blog with lots of great eye candy so if your not familiar with her blog please check it out! Laura quilts on an APQS George sit down machine and she is a great inspiration for domestic and longarm quilters alike! It’s Thanksgiving Monday in Canada so I would like to wish all my Canadian readers a Happy Thanksgiving! This is Maxine’s quilt and the pattern is called In Alignment. It was featured on the cover of Fons and Porter's Easy Quilts, Fall 2013 edition. I have a pattern by Mountainpeek Creations called Arcadia that is very similar but the blocks are laid out a bit differently. Maxine found the fabric at Walmart and just loved the brown,green, teal colors. I used the Tickle panto, Dream Blend batting and white thread. This is Evelyn’s version of our Alternate Routes pattern and she chose to do the rectangular medallion layout. This is the first of these quilts I have quilted for a client and since I presented this pattern to our guild as a Mystery project I know I’ll be getting more. 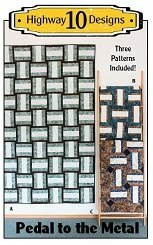 I love seeing what layout quilters are choosing as I have not seen two the same yet. Some are using one of the 20 layouts we gave in the pattern and some are adding their own twist and I love seeing that! Evelyn used white and navy fabrics for her quilt as we suggested high contrast colors for this one. I used Fascinations for the panto design, Navy So Fine thread and Dream Blend batting. Lori and I set up a Flickr page so you can see some of the quilts that have been made with this pattern so far. This is Christine’s Grandpa’s Best quilt and the pattern is by Perkins Dry Goods. She altered the pattern a bit so it has a strong diagonal design instead of the alternating diagonal design of the original pattern. This is a great scrappy quilt and Christine used Buggy Barn style fabrics for her quilt. We decided on Happy Times for the panto design and So Fine thread. She sent nice cozy flannel for the backing and a mid loft poly batt. This is Sheri’s Around the World lap quilt which is a variation on the traditional Trip Around the World pattern. She pieced it using a Bali Pop and a light batik fabric for the background. I picked Mimosa for the panto and used Dream Blend batting. Used the Plush panto and love the pink Cuddle on the back! This is Ann’s Step By Step quilt which is a pattern by Teacher’s Pet and you can purchase it here. The fabric collection is called Summer House by Lily Ashbury. 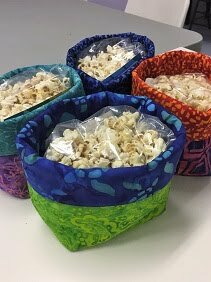 Ann purchased it as a kit from Prairie Rose Quilt shop in Minot, North Dakota. We decided on Rhapsody for the panto design and Quilters Dream Blend batting. I used a light green So Fine thread. Love a calm foggy morning in fall. Pedal to the Metal…Our Second Pattern! I’m thrilled to finally show you Pedal to the Metal, a quilt pattern by Highway 10 Designs which is a quilt design company I share with Lori Suss. For this pattern we wanted to focus on creating quilts that were simple and fast to piece and have options for making twin to king size quilts. 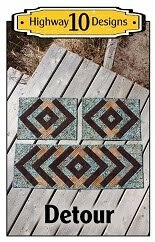 We’ve included three different designs in one pattern with the third having a pieced border. 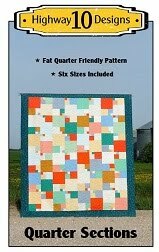 We know may quilters like the option for adding a border especially on a bed sized quilt. The pattern is available to download in PDF form in our Craftsy shop and our Etsy shop. We hope to have a paper version printed in the next month. The first quilt design in our pattern has a woven look from a distance, the narrow outer strips give that illusion. Lori pieced and quilted this one with the Mimosa panto. We used batik fabrics and Quilters Dream Blend batting in all three quilts. The second quilt design in our pattern reverses the outer two strips creating a completely different look. I pieced and quilted this one using the Bayside panto. The third quilt design is our favourite as we incorporated a small diamond element in the blocks and floating in the border. Our friend Robin pieced this quilt top for us and I quilted it with the Whirlygig panto. Here is the cover for our pattern…it was quite an adventure to get these pictures taken. First Lori and I live in two different towns 550km apart so that meant a road trip for me! Luck for me her guild was having a quilt show this weekend so I got to meet some wonderful people and see some amazing quilts. I was hoping to get the photos for our cover done before leaving home but it was raining so much I couldn’t take any. So I brought all the quilts with me to Lori’s and once all the quilt show activities were over we had one day to get the job done. We drove around town looking for the best location and stopped at the Fort Dauphin Museum. The Museum was closed but they have this great post fence all around the grounds. Lori snapped a picture of me at work which was a surprise as she hates taking pictures! You can see how challenging this job was with the wind! Feels good to have our second pattern under our belts and we have a few more in the works. But now it’s time to get back to quilting as I have a busy month ahead of me.